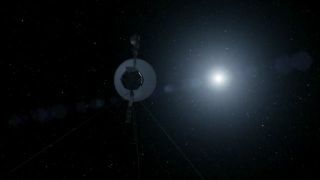 This still from a NASA video shows the Voyager 1 probe nearly 12 billion miles from the sun as it goes boldly into the final frontier of interstellar space as the farthest man-made object in human history. When NASA announced Thursday that its far-flung Voyager 1 spacecraft is now officially the first interstellar spacecraft in human history, it was a time for celebration, congratulations and … "Star Trek"? During a news conference Thursday (Sept. 12), John Grunsfeld, NASA's associate administrator of science missions, walked out to address the public and press about the unprecedented Voyager 1 milestone to the tune of TV's "Star Trek" theme song, effectively melding science with science fiction. You can see a video of the "Star Trek"-themed NASA conference here. John Grunsfeld, NASA Associate Administrator for Science in Washington, speaks at a news conference on NASA's Voyager 1 spacecraft, Thursday, Sept. 12, 2013 in Washington. He quoted "Star Trek" lines to unveil that the Voyager 1 spacecraft has indeed entered interstellar space. "Space: The final frontier," Grunsfeld said kicking off the event by borrowing "Star Trek's" iconic opening words. "These are the voyages of the starship Voyager. Its 36-year mission: to explore strange new worlds, to seek out anomalous cosmic rays and new plasmas, to boldly go where no probe has gone before. Those words from 'Star Trek' have inspired so many of us and I think are characteristic of the excitement and the discoveries we're going to talk about today." Those findings do deserve some fanfare. NASA officials announced that Voyager 1 entered interstellar space in August 2012, 35 years after its launch. By measuring the vibrations of electrons surrounding Voyager 1, NASA scientists were able to determine the point in time where the probe crossed over into interstellar space. Voyager 1 is now about 12 billion miles (19 billion kilometers) from the sun. "Someday humans will leave our cocoon in the solar system to explore beyond our home system," Grunsfeld said during the event. "Voyager will have led the way." NASA's Voyager 1 probe launched to space on Sept. 5, 1977, about two weeks after Voyager 2, its twin. The spacecraft trekked through the solar system on a "grand tour" that got them up-close and personal with Saturn, Jupiter, Uranus and Neptune plus many of the moons orbiting those distant planets.